Take a pan and head oil. Add cumin seeds and let it crackle. Add ginger-garlic paste and stir it for 2-3 times. Add tomato puree and let it simmer. Add salt, turmeric powder, red chilly powder, aamchur powder, garam masala and cook it for about 2 minutes. 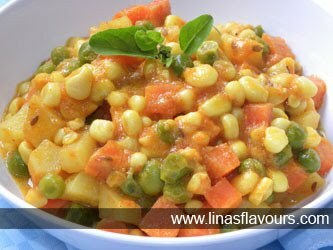 Add corn kernel, peas, carrots, potato and let it simmer for 3-4 minutes. Add water as per the need and cook it for about 2 more minutes. Serve it immediately with paratha or rice.